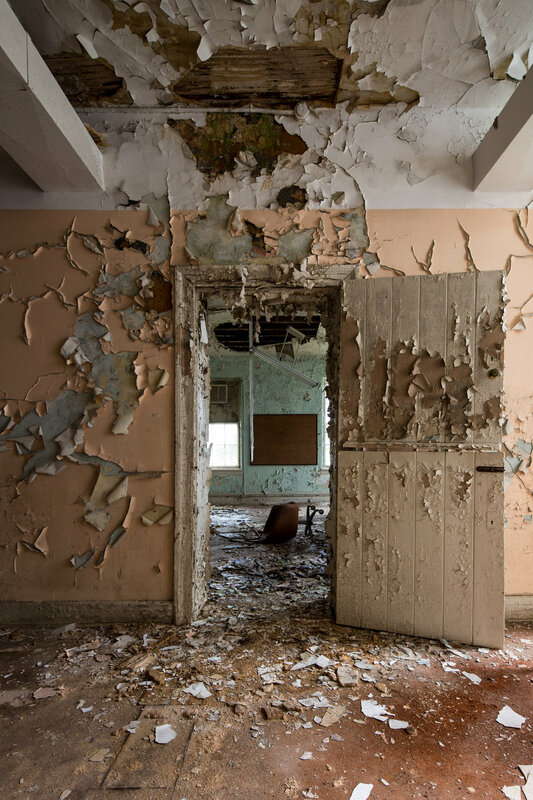 Inside a now demolished state hospital in Tuscaloosa, Alabama. 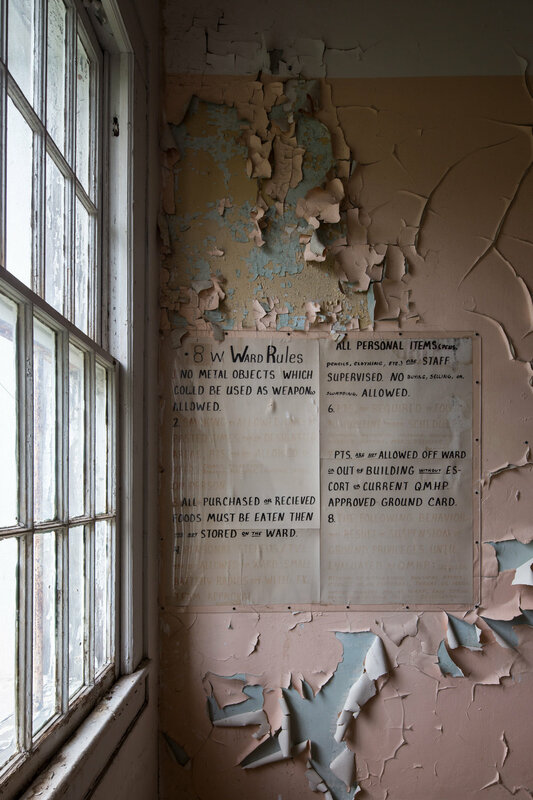 Ward Rules posted inside a patient ward at the now demolished Bryce State Hospital in Tuscaloosa, Alabama. Photo: "Patient Wing at Sunrise"
Inside one of the patient wings of a former Alabama State Hospital, at sunrise. This asylum opened in 1861 and remained in operation for over 100 years. In 2010, the University of Alabama purchased the property and demolished most of the hospital's wings, keeping only the administration section of this historic relic. Lovely morning watching the sun rise from inside a former Alabama asylum. During the first light of day, these walls told many stories. Though not always pleasant, the history here can only be explained by the paint on the walls and the breeze that blows in through an open window. Photo: "Inside An Isolation Cell"
Ever wonder what it would be like to be in seclusion, inside a psychiatric hospital? This room is designed as an isolation cell for patient's that suffered from the more problematic mental diseases or ones that rendered them dangerous to themselves or others. The windows in the door gave the nurses a way to check on the patients. The top window gave a view of the full room and the lower window would give a nurse eyes on a patient who was hiding against the door. which now have stained my skies grey. Empty, abandoned asylums speak loudly, louder that most believe. There are stories within these walls; some tragic, some hopeful. I can only hope my images tell those stories. Hair Salon inside the former Bryce State Hospital in Tuscaloosa, Alabama. The administration section of the building were preserved, as part of an agreement with the University of Alabama, which purchased the property and building, but the late 1800's era wings were demolished in 2016. Daylight seeps into the hallway from one of the isolation rooms in this Alabama Asylum constructed in the late 1800's. The shadows on the way are caused by slats in the doors of the isolation rooms. These slats allowed nurses to check on patients and also allow air flow into the room during very hot and humid summer months many years before air handling units were installed. The early morning sun breaks through the window of this Alabama asylum and lands on the crumbling wall of a day room in a patient wing. I wish architecture was still designed with the same attention to detail and ornamentation as it was back in the early 1900's. Photo: "The Time Has Passed"
When this Alabama State Hospital was constructed in the late 1800's, there was no electricity and air conditioning. These doors, leading into patient rooms, contained slats to ventilate the room. At some point, likely in the early 1920's, the door slats were covered on the inside. Sadly, this asylum has since been demolished. Bryce State Hospital was one of the most beautiful asylums I have visited. Most of the architecture was fairly plain within the wards, but the decay was beautiful and there were elements in this building I had never seen before. Sadly, the wings of this 1850's era building were demolished in 2014, when the nearby University purchased the property. The Administration section of the building remains, and will likely be turned into a museum, but the wards that hold the patient's history are gone forever.